In his lifetime, I somewhat fell prey to this misreading of him. I knew his achievements were considerable, yet I was taken in by his aura of modesty. My ear as a young political reporter for the Honolulu Star-Bulletin was more attuned to his pleasant, low-key approach to conversation. It was his particular way of ending sentences with “Yeh?” that stuck in my imagination as a haole newcomer, and which to this day I employ. Valuing the little things about him, I failed to fully value the big things. So I especially appreciate the opportunity of the 100th Infantry Battalion Veterans project to return to the question of Sakae Takahashi’s place in history, which I am confident in summarizing as follows: He was consistently the path-finder, the leader, the person who took the risky and crucial first steps in both war and peace. He was born on December 8, 1919, which made him several years older than many of his future comrades in battle. He grew up in Makaweli Plantation Camp #4, up the long slope of the south side of the island of Kauai. His father and mother were from the same village in Niigata Prefecture in northern Japan, unlike most Japanese, who were from the south. The elder Takahashi worked in the sugar fields and then started a little business under a shade tree, where he sold a few basic grocery items. He was required to buy his goods from the plantation, so his profit margin was small and controlled. He made friends with a Chinese cook who taught him how to make pickup food, such as manapua, which yielded an additional income. Sakae respected him: “He was quite a man.” His wife did not have to work in the sugar field, and his children could go from elementary school to high school. He professed surprise to be asked to continue ROTC into his junior and senior years at UH. He was a dual citizen – a citizen of both Japan and the United States – as were many Nisei, resulting from parental registration at birth with the Japanese consul. 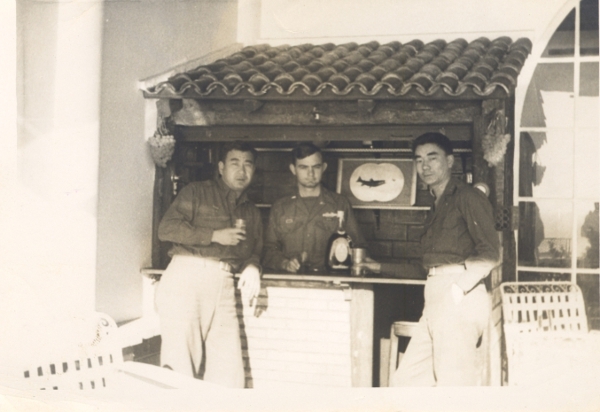 To qualify for his Army Reserve commission, Takahashi first was required to expatriate (or renounce) his Japanese citizenship, a cumbersome task that his father supported. In June 1941, at 21, he became one of the few nonwhite U.S. Army officers in the Territory of Hawai’i. That fall, he taught agriculture in the vocational education program of Aiea Intermediate School, overlooking Pearl Harbor. Periodically the Army set up anti-aircraft guns near the school, which forced him to consider the possibility of a pending war. On December 7, he had a bird’s eye view of the destruction. In an interview conducted for the Japanese Cultural Center of Hawai’i, I pressed him for his reaction. “I was angry,” he said, in his typically terse way. His route into the 100th Battalion was unusual. 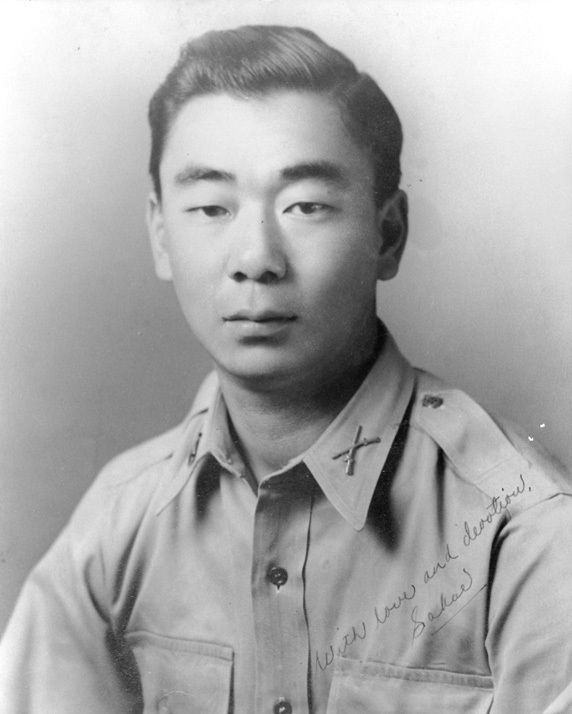 Although the 100th is typically described as consisting of Japanese American draftees who were on duty at the moment of attack, Sakae was neither a draftee nor on active duty. He responded to the December 7 call by reporting to the Hawaii Territorial Guard (HTG) at the armory in downtown Honolulu. He issued weapons and ammunition, rigged firing pins, and then stood guard at strategically important installations. On December 22, he was transferred to his home island of Kauai to serve with the recently federalized 299th Infantry Regiment. He was stationed at Barking Sands, on the far southwestern corner of the island, and again stood guard overlooking the wide beaches. After six weeks, he was promoted to first lieutenant. By this route, he was exempted from the heart-wrenching January 19, 1942 demobilization of the HTG on Oahu, in which Japanese Americans were stripped of their arms and turned out of their unit. As national and local tension mounted over the status of Japanese aliens and Japanese Americans, the Secretary of the Navy pressed publicly — and the President pressed privately — for a mass removal of a major portion of the Japanese-ancestry population from Hawaii. The on-the-ground counterweight was the martial law governor of the islands, General Delos Emmons. With the benefit of circles of local advisors, Emmons concluded that a mass internment in Hawaii would be folly, and that Japanese Americans were loyal and eager to fight. Employing a certain slight of hand, Emmons used the national pressure for relocation to extract the Japanese Americans from the 298th and 299th Infantry Regiments and ship them to Camp McCoy, Wisconsin for military training.2 It was a relocation of a sort, if not what advocates of internment had in mind. Lt. Takahashi shipped out of Kauai on May 30, 1942. Five days later he was among the fourteen hundred men who constituted the pioneer core of the newly named 100th Infantry Battalion. Certain histories have minimized Emmons’ boldness – perhaps his brazenness – by saying it coincided with America’s first great naval victory at the Battle of Midway. However, the fact was that Takahashi and the 299th shipped out of Kauai nearly a week before Midway, and they shipped out of Honolulu on June 5, while the battle at Midway raged. According to Masayo Duus, author of Unlikely Liberators, The Men of the 100th & 442, it was Takahashi who first led the conversation among the Japanese American soldiers about not only proving themselves in battle, but changing post-war Hawai. He was quoted as saying the moment would come when veterans would be challenged to serve as catalyst of a new Hawaii, first in politics and then in business: “We’re fighting two wars, one for American democracy,and one against the prejudice toward us in America. That’s a fact even in Hawaii.”5 Hoping to nail down a seminal moment in Hawaii’s political history, I asked Sakae about this quote. To my chagrin, he said he didn’t recall it. Deflecting attention from himself, he periodically told me I should get to know his good friend Young Oak Kim, the battalion’s legendary Korean American warrior.6 When finally it was my privilege to do so, Kim said the talks in question occurred on five straight weekends at Camp McCoy around a bonfire, including all the Nisei officers, himself and some of the haole officers as well. “The discussions became endless and very passionate,” he said, with Sakae pressing two points: “The 100th must excel in combat and we as individuals must set the example or none of the solutions proposed would work.”7 Granted, the theme of transforming Hawaii was in the air, but the camp story is unique. It is the basis for concluding that Takahashi was central to launching the discussion among Japanese American soldiers that specifically linked their performance to a social and political transformation of Hawaii. About Sakae Takahashi, it can be said unequivocally that he rose steadily in his contribution, his rank, and in the esteem of others. After serving as a platoon leader, he served as executive officer of F Company. After F Company was so decimated that its survivors were distributed to other companies, Takahashi assumed battlefield command of B Company. As a company commander he was promoted to Captain and participated with battalion headquarters in developing battle plans – most significantly with Young Oak Kim, who had become the battalion Intelligence Officer (S-2) and then the Operations Officer (S-3). Command of the 100th Battalion changed many times (the journalist Lyn Crost counted over a dozen times), but officers such as Takahashi, Young Oak Kim and Mits Fukuda were seemingly the enduring and steadying hands in the many desperate and deadly battles against the Germans.